...that Cabal Psions are a different species from other Cabal units? ...that many Guardians were killed by Crota and his armies during the battle to reclaim the Moon? Destinypedia has a walkthrough guide to this level, The Wretched Eye. See The Wretched Eye/Walkthrough. The Wretched Eye is a Level 38 Strike that sends Guardians to the depths of a Hive nest located within Bunker Triglav, to stop Kovik, Splicer Priest from infusing a captive Hive Ogre with SIVA. Shiro-4: The Splicer's High Priest has crews pushing further underground in the Plaguelands, looks like a large scale mobilization against a Hive nest. Ghost: An army of Hive controlled by the Splicers would be the end of Old Russia. Shiro-4: Could be the end, of everything. Shiro-4: The Devils are evolving, neutralize them before this goes any further Guardian. A trio of Guardian ships fly to Old Russia, dropping the Player off at the Forgotten Pass. Shiro-4: Alright, there's a series of old missile silos near the bunker. I've got reports of Hive near that location. Ghost: Sounds like the place to be. Shiro-4: For my Glimmer, yeah. And remember, target anything that moves. Every kill gets us one less Splicer or Hive to be warped by SIVA. The Guardian approaches a bridge where many Hive and Splicer enemies are battling each other. The Guardian kills them and destroys the Hive Traps along the way. On the other side, the Guardian is attacked by more Hive and Fallen who are deployed by a SIVA-infused dropship. They are killed and the Guardian continues to the Silos. Ghost: I'm picking up several concentrated SIVA Nodes ahead. 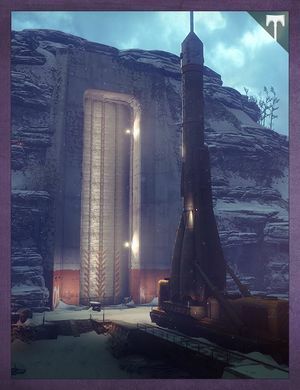 Shiro-4: The Splicers are using SIVA to augment the Silo's old defense protocols. They've got the inner doors sealed tight. If you want to get inside, you'll need to find and destroy those SIVA Nodes. The Guardian reaches a location designated as Bunker Triglav and after eliminating the Splicers and Hive guarding the entrance, destroys the first of four SIVA Nodes. Entering the Silo, the Guardian kills all of the enemies within before finding and destroying two more Nodes. Ghost: Picking up one more Node, let's go get it. Guardian finds final Node and after killing all enemies, destroys it. Ghost: That's the last Node, security protocols are clear and hack-able. Guardian approaches Silo's inner doors which Ghost now opens. Hoards of Fallen attack. Ghost: The Splicers have fortified the entrance, we've got heavy resistance. Shiro-4: They must have driven the Hive deeper into the Silos. Fight through it. Guardian kills enemy hoard and destroys several SIVA Nodes acting as turrets. Ghost: I am reading new SIVA energy spikes below us. Multiple Nodes, all powering another barrier. But I can't nail down their locations. The readings are too sporadic. Shiro-4 You know what to do Guardian, find those nodes, unload on them, and keep moving. The Guardian locates one of the SIVA Nodes being guarded by Splicer Vandals, and destroys them both. Ghost: It's hard to get a clean reading down here, keep moving. The closer we get to each Node, the easier they are to unmask. Guardian explores the area, looking for the next Node. Ghost: Looks like the Splicers have taken this hatch room. The Hive bio-organic architecture is still in tact, but there are micro-bursts of SIVA activity all around us. Shiro-4: Used to be the Fallen would attack for resources, for survival, revenge. To invade a Hive nest like this, SIVA's changed them. The Guardian encounters more Fallen and another SIVA Node. Both are destroyed. Ghost: Alright, still getting strong SIVA readings. There must be another Node. The Guardian discovers the final SIVA Node guarded by more Splicers. Ghost: That did it. No idea what those nodes were protecting, but the barriers down. Guardian continues their descent into the Hive nest. Shiro-4: You're all that stands between the Splicer's High Priest, and whatever mad science he is cooking up down there. End this. Guardian kills a group of Splicers and their Servitor. Ghost: This doesn't look good. Shiro-4: Did you find the High Priest? Guardian finds the captive Hive Ogre. Ghost: Let's get a closer look at that thing. Ghost: Makes you wonder what they're willing to do to us./That Ogre is...well, that's disgusting. Shiro-4: Sounds like you're about to find out. Eyes up, Guardian!/There's more where that came from if the High Priest isn't removed from the field. Kovik, Splicer Priest appears, roaring a challenge. The Guardian kills him. Ghost: What a mess, the High Priest wasn't looking to build a Hive slave army, he was just removing their body parts to be joined with SIVA. Shiro-4: Bioengineering's become the Splicer's main M.O. We're luck to have dropped their High Priest before he can perfect any of this madness, but, it's gotta make you wonder; what other perversions are they planning? The Wretched Eye is the only strike that was added to Destiny with the Rise of Iron expansion. The others were only remastered. The Ogre being held captive by the Devil Splicers. Kovik, Splicer Priest, the main boss of the strike.